Guanajuato is a picturesque old town of the central highlands of México, famous for its narrow and steep streets, its colorfoul houses and colonial-era baroque monuments. It is the capital city of the homonymous state, and seat of the 280-year old University of Guanajuato. Guanajuato is the venue of the most important artistic event in Latin America: the International Cervantes Festival, which is celebrated every year in October. The city has important art, cultural and historical museums, such as the famous Alhóndiga, where the first battle in the struggle for Mexican Independence was fought. For further information visit www.visitmexico.com. The Center for Research in Mathematics A.C. (CIMAT) is one of the National Council of Science and Technology’s (CONACYT) Public Research Centers. It was founded in the city of Guanajuato in 1980 with the aim of fostering research, study, development and dissemination of mathematics and its applications in various areas of scientific and technological development. To generate scientific knowledge in its areas of expertise. To offer undergraduate and graduate programs in the specialty areas of the Center. To strengthen the relationships with public, private and social sectors through applied research projects, technology and consultancy services and the dissemination of mathematical knowledge in general. CIMAT now has sites in the cities of Aguascalientes, Monterrey and Zacatecas, with emphasis on boosting competitiveness and economic growth in both public and private enterprises. CIMAT is located on top of a hill at about 2400m above sea level near the magnificent barroque church of Valenciana and overlooking the valley of Guanajuato. The building has an interesting architecture that reminds of M.C. Escher's imposible structures. The University of Guanajuato is the biggest public University of the state of Guanajuato with about 33,800 students ranging from high school through posgraduate levels. The university offers 153 academic programs, including 52 posgraduate (master and Ph.D.) and 65 undergraduate programs. 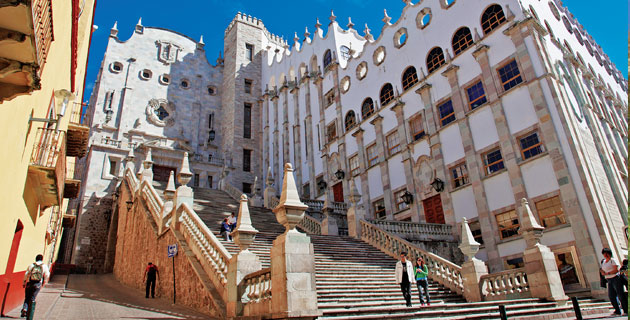 The main auditorium, where PSIVT 2013 main conference will be located is in a beautiful building in downtown Guanajuato.